South Korea, Germany and Singapore are the world’s top-ranked nations in their preparations for smoothly integrating intelligent automation into their economies, according to an index and report released today by ABB and The Economist Intelligence Unit. The report "The Automation Readiness Index (ARI): Who Is Ready for the Coming Wave of Innovation?" finds that even the best-prepared countries must develop even more effective education policies and training programs, as well as place a new emphasis on continual learning over the course of a career. Those policies and programs, the report recommends, must ensure that the rapid adoption of automation technologies and artificial intelligence (AI) will not leave people unprepared for the new, more human-oriented jobs that will be needed as robots and algorithms take on more of the routine tasks that can be and will be automated. "The report showcases the success pattern of the future. We must take advantage of these recommendations," says Ulrich Spiesshofer, CEO of ABB. "The pace of innovation and job change today is so fast that everyone must have access to lifelong learning. Augmenting human potential with technology, in a responsible way, while providing ongoing education and training, is an opportunity to drive prosperity and growth." The report, which surveyed and ranked 25 countries on their automation readiness, found that many nations across the globe are just beginning to come to grips with the opportunities and challenges posed by AI and robotics-based automation. It found that "more engagement between government, industry, educational specialists and other stakeholders is needed if policymaking is to keep pace with innovation in automation." The report emphasizes that, whether policymakers are ready or not, businesses are rapidly integrating AI and advanced robotics into their operations. As that adoption accelerates in coming years, the impact on economies and workforces – and the need for a more concerted approach to education and training – will become clearer, and more urgent. 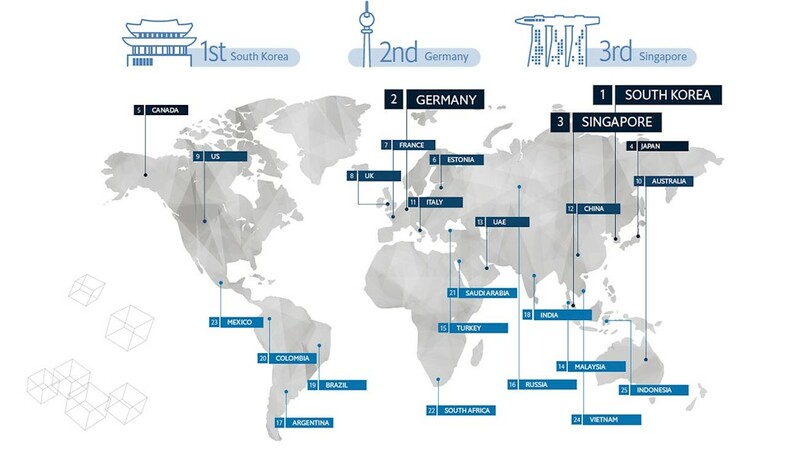 In addition to South Korea, Germany and Singapore, the countries best positioned to embrace this wave of change are the other members of the ARI that round out the top 10 in ranked order: Japan, Canada, Estonia, France, the United Kingdom, the United States and Australia. The analysis in the report is based on a new and original index, built by The Economist Intelligence Unit, as well as a series of in-depth interviews with subject matter experts from around the world. Rankings were determined based on a total of 52 qualitative and quantitative indicators selected in consultation with experts in automation, education and economics. Through its YuMi collaborative robot and ABB AbilityTM cross-industry portfolio of digital solutions for monitoring and controlling automation systems, ABB is helping manufacturers shaping factories of the future, where people remain a vital part of operations, working side by side with robots. This new paradigm of human-robot collaboration has the potential to free people to focus their time and energy to higher-value work requiring human skills and talent, while leaving to robots the highly repetitive or physically demanding or even dangerous tasks. Such human work is likely to include designing the processes and operations for the robots to carry out, and also monitoring and overseeing the automated work performed by the machines. Ideally, a successful transition to a manufacturing economy built around intelligent automation will provide human talent with the opportunity to achieve higher levels of productivity, and, ultimately, more rewarding jobs. But to achieve that better future, the report notes that most countries will have to elevate their vocational training programs. Science, technology, engineering and mathematics (STEM) curricula remain important, the report finds. But automation and AI place even greater need for basic education programs and new types of teacher training. ABB and The Economist Intelligence Unit plan to conduct the ARI research annually and revise the rankings each year as warranted. That will enable the index to fulfill its purpose as a tool to help governments continually identify and pursue policies that support successful participation in the highly automated, intensively digitalized global economy. For its part, ABB is preparing for the future by creating “digital workplace” environments, training employees to use digital and automation tools. ABB also supports innovation at its corporate research centers and via collaborative partnerships with startups through the ABB Technology Ventures (ATV) venture capital unit. In the global policy and educational arenas, ABB remains committed to continuing its work with trade bodies, multilateral organizations and academic institutions. The company also stands ready to brief public policymakers as requested, to enable intelligent automation to become a positive benefit to society by delivering higher levels of productivity and creating meaningful employment opportunities.